Last week, I wrote at my JPost blog about efforts at the UN to blacklist the IDF – together with savage terror groups like the Islamic State – as an entity that regularly harms children. The post is reproduced below, but since Human Rights Watch (HRW) is now so energetically pushing for Israel’s inclusion in this “list of shame,” I felt it is worthwhile to add this update as a reminder of the organization’s shameful bias against Israel. HRW’s persistent negative focus on Israel is well documented, and I have written about the organization’s double standards and the animosity against Israel that is openly displayed by HRW executive director Ken Roth. As I have noted in my previous posts, HRW always stands ready to condemn Israel as soon as the Israeli army moves to defend the country’s citizens against the attacks of terror groups. HRW would perhaps claim that its latest effort is even-handed, since it apparently also recommended the inclusion of Hamas in the UN’s blacklist. 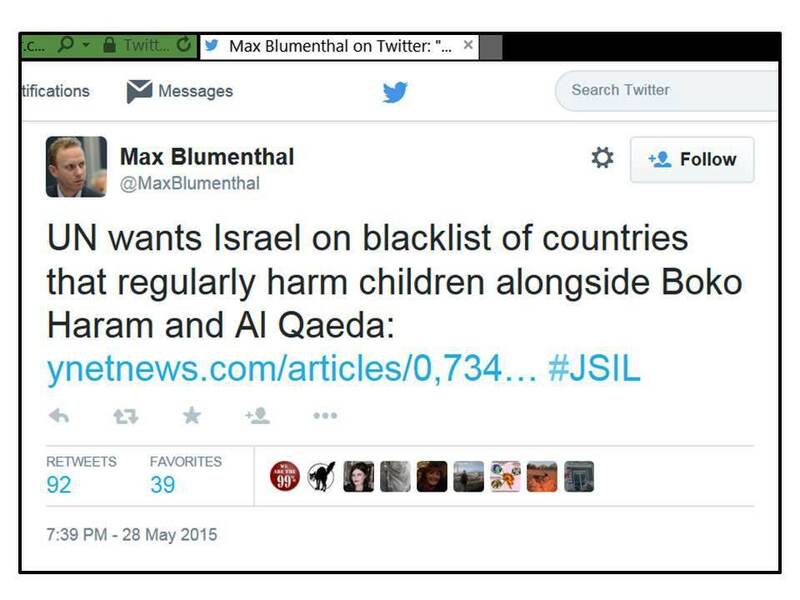 But this of course means that HRW sees no difference between Israel and Hamas when it comes to harming children. One should not overlook that HRW describes Israeli attacks on rocket launching sites as “retaliatory attacks” – which is of course just another not so subtle attempt to delegitimize Israel’s right to defend its citizens. Among the Palestinian violations that HRW prefers not to mention is the longstanding training and recruitment of child soldiers. And of course HRW also prefers to ignore the fact that Palestinians have repeatedly celebrated terror attacks that killed Israeli teens. How low can the UN sink? The United Nations (UN) has a long and sordid record of singling out the world’s only Jewish state for hypocritical censure and condemnation. Most recently, Israel was the only country to be condemned as “a violator of health rights;” unsurprisingly, the supporting “evidence” included antisemitic claims by the Syrian regime, which accused Israel of “continu[ing] to experiment on Syrian and Arab prisoners with medicines and drugs and to inject them with pathogenic viruses.” That is of course the same regime that mercilessly bombs and kills its own population, while Israel has so far treated some 1600 injured Syrians. As the report notes, the UN is “facing heavy pressure from the Palestinians, their supporters and human rights organizations to include the Israeli army on the list.” However, few people know that this kind of “pressure” is in part generated by the UN itself, which sustains “a whole network of anti-Israel institutions ” that were built up in the wake of the infamous “Zionism is Racism”-resolution of 1975. Even though the resolution was repealed in 1991, this “network of extremely well-funded UN structures and offices” continues to exist to this day. Needless to say, those who love the Nazi-slogan “Die Juden sind unser Unglück” in its 21st-century version “The Jewish State is our misfortune” are excited about the prospect to have the IDF equated with terror organizations like al-Qaeda and the Islamic State (IS) – and as was only to be expected, Max Blumenthal tweeted the Y-Net report adding the hashtag JSIL, which he popularized to associate Israel with the terror group Islamic State (once known as ISIL, i.e. Islamic State in the Levant) as “Jewish State in the Levant” (JSIL). If the UN will once again please Jew-haters everywhere with yet another bigoted condemnation that puts the IDF on the same level as savage terror groups like IS remains to be seen. But in the unlikely case that the UN actually cares about the welfare of Palestinian children, Leila Zerrougui, the Special Representative for Children and Armed Conflict, could highlight the longstanding abuse of Palestinian children as child-soldiers – indeed, campaigning against this kind of child abuse is supposedly an important part of her work. 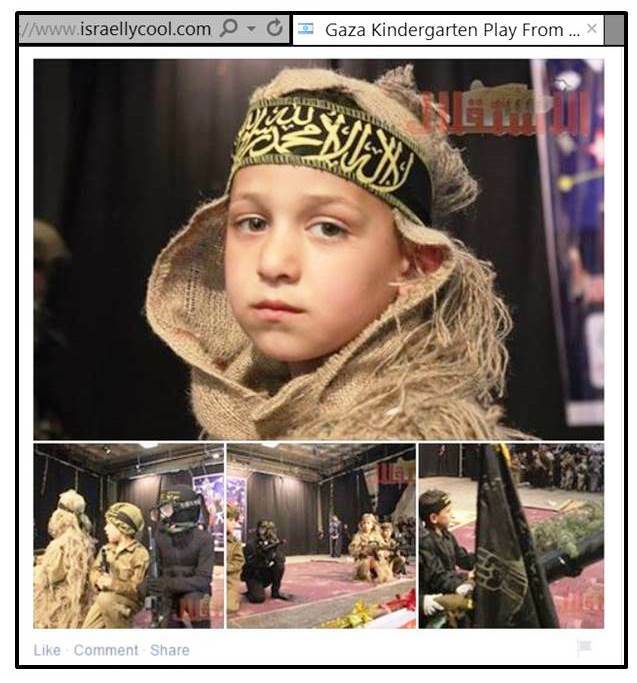 While all Palestinian factions have used children to fight, nowadays mostly Hamas and other Gaza terror groups openly boast of providing military training to children; one of the most recent examples is a “graduation ceremony” in a Gaza kindergarten. In addition, the UN might note the fact that Hamas employed children to dig its extensive tunnel network – which they hoped to use to kill Israelis, including children – and that at least 160 children died working on the tunnels. And perhaps the UN’s Special Representative Leila Zerrougui could take note of regular TV programs that indoctrinate kids to hate and “shoot the Jews” – ‘all of them’? Perhaps it would also be appropriate to address the very high percentage of forced underage marriages in Gaza? Or the heartbreaking mistreatment of children with disabilities that seems quite common in Palestinian society? Maybe it’s a bit late in the new year to make predictions, but anyone still looking for a safe bet might want to agree with an anonymous European diplomat who reportedly told his Israeli counterpart towards the end of last year that Israel will lose “the blame game” if the current peace negotiations end in failure. According to a Ha’aretz report, the European diplomat also threatened Israel with “a deluge of sanctions” in case “the negotiations with the Palestinians run aground,” irrespective of the reasons for the failure to reach an agreement. For the Palestinians, this is of course good news – though it’s really just more of the same: after all, the UN has designated 2014 as “Year of Solidarity with the Palestinian People” and a number of events decrying “the unprecedented historical injustice which the Palestinian people have endured since ‘Al-Nakba’ of 1948” have already been held at the organization’s headquarters in New York. The UN’s willingness to show “solidarity” with a people that has rejected a state of their own for 65 years illustrates that the anonymous European diplomat quoted above is merely following the long established practice of rewarding the Palestinians for their refusal to come to terms with the re-establishment of the Jewish state. This short statement provides an excellent illustration of the fantasies that underpin some of the central Palestinian negotiating positions. The most notable point is arguably the admission that recognizing Israel as the Jewish state implies acknowledging the millennia-old Jewish history in the region, which according to Al-Maliki would be tantamount to “the dissolution” of Palestinian history and the resulting claims. While Binyamin Netanyahu demonstrated in his Bar-Ilan speech in June 2009 that it is perfectly possible to stick to one’s own history and still concede that the present time requires difficult compromises, Al-Maliki is providing here a rare admission that Palestinian history is too flimsy to back up the Palestinian narrative of being an “indigenous” population that is fighting for their ancient rights against a foreign intruder. The second noteworthy point is Al-Maliki’s worry about the “fate of the 1.8 million Palestinians living in Israel.” The PLO has always upheld the fiction that it represents all Palestinians, whether they want it or not, and wherever they reside, even if they are citizens of other states. Therefore, it probably doesn’t matter much to Al-Maliki that not all Arabs in Israel define themselves as Palestinians, and that even those who do are apparently not very enthusiastic about living under Palestinian rule. Indeed, as a recent poll showed, even among those who like to complain loudly about being a minority in the Jewish state, many prefer this status to being citizens in a Palestinian state. Finally, there is Al-Maliki’s point about the “refugees and the right of return.” Apparently he feels that recognizing Israel as the Jewish state would somehow complicate the demand that millions of descendants should “return” to the places that previous generations of Palestinians left to escape the war fought on their behalf against the fledgling Jewish state. While this demand is anyway completely unrealistic, Al-Maliki reaffirmed – as many Palestinian officials have done before – that the Palestinians would continue to insist on this imaginary “right” to turn the Jewish state into yet another Arab-Muslim state. “Israel’s current conditions for a Palestinian state would shatter Palestinians’ basic demands for liberty and independence. The promised Palestinian state will be nothing but a shadow entity completely ruled by Israel. And the price that is being demanded for this state is so exorbitant that the Palestinian Authority cannot sell it, nor can the Palestinians accept it. Jarbawi’s article is arguably an important read, because it shows a former Palestinian minister declaring once more quite openly that a demilitarized Palestinian state comprising most of the previously Jordanian-occupied West Bank and Egyptian-controlled Gaza is simply completely unacceptable to the Palestinians. Unintentionally, Jarbawi also illustrates how Palestinian propaganda works: while he clearly says the Palestinians would violently reject any realistic two-state solution, he also deviously claims that it’s their shattered hopes for a two-state solution that would result in an explosion of violence – and he can probably expect quite a bit of sympathy for this “explanation” from his New York Times readers. But it’s not just in the UN “Year of Solidarity with the Palestinian People” that Palestinian rejectionism and calls for violence are politely overlooked and even rewarded. If the negotiations don’t produce any results and the Palestinians once again resort to terrorism, they can count on the UN and much of the international media to get plenty of attention and sympathy for their continuing efforts to blame and delegitimize Israel. Under the title “Netanyahu the fundamentalist,” David Landau grimly predicted in a recent Ha’aretz column that “History will damn the Israeli prime minister’s obsessive demand for the Palestinians to commit heart and soul to the idea of Israel as the ‘Jewish State’ as a precondition for peace.” Needless to say, this was not the first Ha’aretz article opposing Netanyahu’s stance – and needless to say, blaming Israel in general and Binyamin Netanyahu in particular for the lack of peace is always a crowd pleaser for the audiences Ha’aretz caters to. But Landau’s piece was so weak and contradictory that it only helps to make the case for Netanyahu’s demand. If it was true that Abbas “uses the same vocabulary today,” it should hardly be a problem for the Palestinians to recognize Israel as the Jewish state. Landau probably knows all too well that the problem is not just “Palestinian opinion,” but rather the fact that the PLO claims to be “the sole legitimate representative of the entire Palestinian people” – which, as far as the Palestinians are concerned, includes Israel’s Arab citizens (irrespective of the question whether they regard themselves as Palestinians and want to be represented by the PLO). It is important to realize that Palestinian advocates have even used this claim to argue that a Palestinian state is not all that desirable since it could only represent its own citizens and not Palestinians who are citizens of other countries, including Israel. Similar notions about statehood requiring the Palestinians to give up on various claims and all sorts of imaginary “rights” are reflected in the views of many “one-state” proponents and in the vicious anti-Israel propaganda of sites like the Electronic Intifada. After all, there are plenty of states that define themselves in no uncertain terms as the nation state of a particular group, and as far as I know, nobody has yet thought of withholding recognition because there may also be minorities in this state that do not identify as part of the nation. 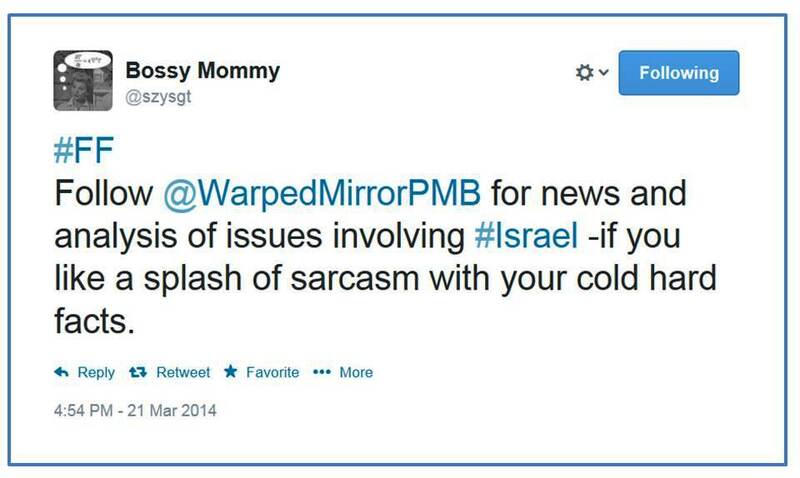 Moreover, when we look around in the region, Israel is for sure the best place to live when you belong to a minority. Like minorities everywhere – including in Europe – Israel’s Arab citizens may have reason to complain about various disadvantages, but most are arguably better off than if they lived in a neighboring state as part of the Arab majority. In this context it’s also interesting to note that Palestinians don’t seem to have similar demands and claims towards Arab states with sizable Palestinian populations. Is it acceptable that Jordan is the “Hashemite Kingdom of Jordan” when at least two thirds of its population is Palestinian? Well, maybe Jordan doesn’t count, since it has already a Kuwaiti-born Palestinian queen… And indeed, we do know that the Palestinians didn’t demand a state while the West Bank was annexed by Jordan and Gaza was administered by Egypt. One could almost think that the Palestinians only start to have problems when Jews are involved. But while Netanyahu probably can’t say anything that would cause his left-wing critics to let go of their convenient bogeyman, Haviv Rettig Gur has recently argued – rightly, in my view – that Netanyahu’s demand that the Palestinians make peace with Israel as the Jewish state must be understood in the context of the well-documented Palestinian demonization of Israel as fundamentally illegitimate and evil. As it turns out, not even a veteran Israeli dove like Jerusalem Post columnist Gershon Baskin can argue on a Palestinian website in favor of the demand to recognize Israel as the Jewish state. Baskin writes that he can’t quite understand why the Palestinians would find it so difficult to recognize Israel as the nation-state of the Jewish people. But it’s not so hard to explain: the two major components of Palestinian identity are the very recent secular one which depends almost exclusively on implacable hostility to Israel, and the religious one which is based on centuries of Islamic imperialism and supremacism. Acknowledging that an ancient people like the Jews have any rights in their historic homeland will inevitably undermine both the secular and the religious component of Palestinian identity. Two states for two peoples is a nice-sounding formula, but unfortunately, it’s not clear that the Palestinians have a strong enough identity to really feel as a people that can pull together for the difficult task of building a functioning state. Of course, Gaza is already a statelet, and the vast majority of Palestinians in the West Bank are living under the rule of a Palestinian administration that is recognized by most UN members as representing the Palestinian state. The bizarre make-belief quality of this UN recognition may well carry over to any future “peace” agreement; yet, since it would mean the end of Israel as we know it – and the end of Israel as the Jewish state – to absorb the Palestinians on the West Bank as Israeli citizens, I’m all for a solution that would somehow resolve the problem of Palestinian statelessness. A heartbreaking picture dominated the world media last November, just a day after Israel launched its “Pillar of Defense”-campaign to stop the barrage of rockets from Gaza. 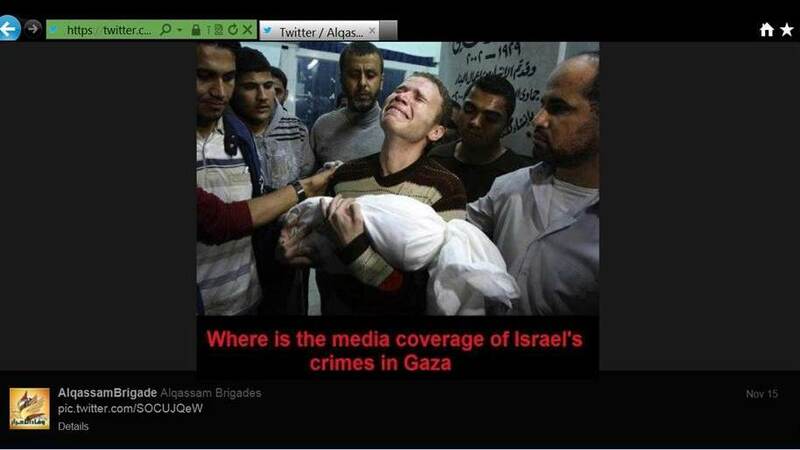 The picture showed a grief-stricken young father in Gaza holding the shrouded body of his baby son. 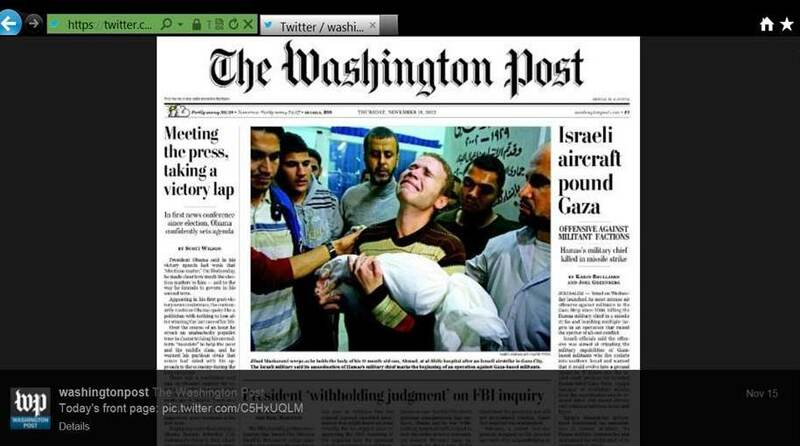 The Washington Post was among the newspapers that featured the photo prominently on its front page. Months later, the BBC continues to feature this story – despite the fact that by now, a UN investigation has concluded that baby Omar Masharawi (also spelled Mashhrawi or Misharawi) was indeed killed “by what appeared to be a Palestinian rocket that fell short of Israel.” As BBC Watch notes, the relevant UN report has been published four days ago, and the BBC hasn’t yet gotten around to issuing any correction to its original stories. The same is probably true for most of the mainstream media that prominently featured this tragic image and the related story – and even if corrections were issued, they wouldn’t be given the prominent and dramatic coverage that the original received. The grief-stricken father in Gaza holding the shrouded body of his beloved baby son will inevitably become part of the “lethal narratives” that are spread eagerly by mainstream journalists who have long embraced the notion that Goliath Israel is cruelly oppressing and killing the Palestinian David. 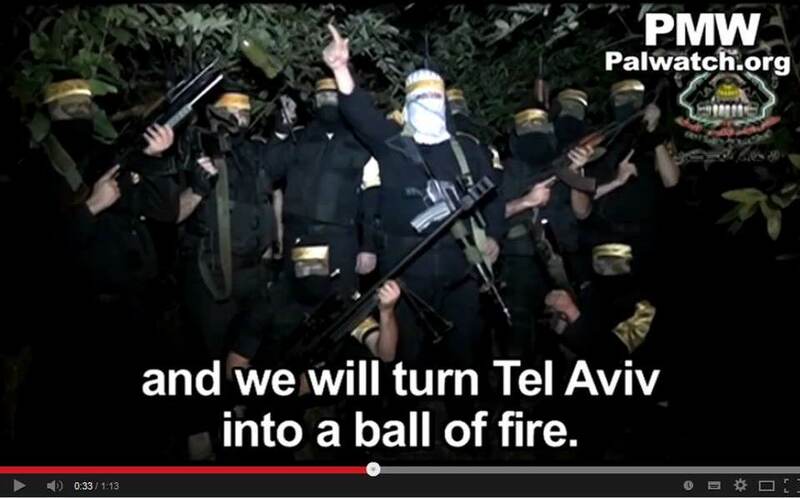 Of course, the rocket was fired with the intention to create such a scene in Israel. Pexton also argued that “an effective photograph…moves the viewer toward a larger truth” – though he didn’t make entirely clear what he had in mind. 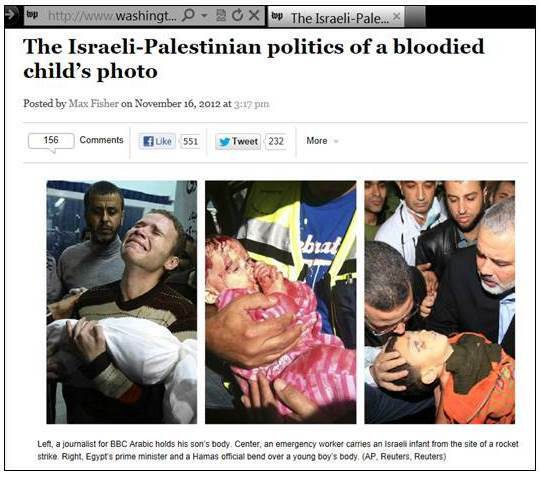 But he also linked to a related Washington Post article on “The Israeli-Palestinian politics of a bloodied child’s photo,” which featured three images: the first on the left is the photo that was the controversial choice for the Washington Post’s front page; the one in the middle is an injured Israeli infant, and the third photo is again from a boy killed in Gaza who was rushed to Gaza’s Shifa Hospital just when Egypt’s Prime Minister was visiting there with Hamas leader Ismail Haniyeh. Whatever story Max Fisher thought the three photos were telling and whatever uplifting contemplations he intended to offer, the plain truth is that all three children were victims of rockets shot by Hamas and other Gaza terrorists. The plain truth is also that they hoped that only Israeli children would be injured or killed by their rockets, but they knew that if they wouldn’t quite succeed and some children in Gaza got killed by their rockets, nobody would hesitate to blame Israel for it. After all, everyone knows that the strikes of the Israeli Goliath kill, while the attacks of the Palestinian David are merely “bee stings on the Israeli bear’s behind” – and who cares that every Israeli strike that kills a Palestinian child or civilian is considered by the Israeli military and the vast majority of the Israeli public a tragic event, while every Palestinian “bee sting” that kills an Israeli child or civilian is considered by Palestinian terror groups and their supporters a reason to cheer and celebrate. The Washington Post’s Max Fisher certainly doesn’t care about this well-documented fact, as his not-so-subtle exercise in equivalency illustrates: “a child’s body, struck by a heartless enemy” implies after all that just as Hamas is a “heartless enemy” to Israel’s children, the IDF is an equally “heartless enemy” to Palestinian children. As far as Fisher is concerned, this is the “story” told by the three images he comments on. But it is of course he who is telling a story about heartless enemies wounding and killing innocent children. I doubt that Fisher will take the time to revisit his story and ponder how much – or rather how little – sense it makes once we know that each of the children shown in the photos was a victim of Palestinian fire. Fisher focuses mainly on arguing how terrible it is that there are controversies about such photos and the stories they supposedly tell. But as this example illustrates so well, it is always people who tell stories about images, and it indeed matters a lot what stories they tell – because facts matter if we want to understand reality. Of course, when it comes to the conflict between Israel and the Palestinians (and the broader Arab and Muslim world), focusing on facts and their proper context isn’t all that fashionable. Cross-posted from my JPost blog. In the end, quite a lot of media outlets reported the UN finding that the son of Jihad Mashrawi was most likely the victim of a Palestinian rocket. However, as J.E. Dyer rightly points out in her excellent and detailed analysis of several incidents that were falsely blamed on Israel (“Oops – The IDF didn’t kill Baby Mashrawi (and other things that didn’t happen during Pillar of Defense)”), this incident showed once again that media organizations that care about their reputation should be considerably more careful about vetting their sources and verifying the details of events they report on. The perhaps most impressive correction for the Masharawi incident was published by AP, which had taken the widely published photo of the mourning father back in November. “But, as I wrote in November when reports suggested that an Israeli strike had killed Mishrawi, does knowing which military’s errant round happened to have landed on this civilian home really determine the larger narrative of one of the world’s thorniest and most complicated conflicts? Does assigning blame for Mishrawi’s tragic death, awful as it may be, offer us any real insight into who holds the blame for 60 years of fighting? And is partitioning blame really going to serve either side particularly well? While this is pure nonsense on several levels, I will for now just note that if Fisher wants to see Hamas and other terror groups in Gaza as a “military” just like the IDF, he would have to hold them both to the same standard – which means he would have to deal with the fact that Hamas and the other Palestinian terror groups intentionally target Israeli civilians and are jubilant if they manage to kill or maim them. The fact of the matter is that there wouldn’t be any photos of wounded or killed children from Gaza if Palestinian terror groups stopped using the territory they control as a launching pad for mortars, rockets and terror attacks on Israel. The reign of terror imposed by armed Islamists gangs who seized control of northern Mali has been widely reported. Last spring, these groups took advantage of the destabilization that followed a coup in the country that was once considered one of Africa’s most stable democracies. In the areas they control, the Islamists proceeded to not only ruthlessly destroy ancient Muslim mausoleums that are listed as UNESCO World Heritage sites, but also to impose their brutal rule on the defenseless population. In December, the United Nations Security Council sanctioned an African-led military intervention in Mali; however, the deployment of these forces was only in the planning stage when Al-Qaeda linked groups recently made further advances. Following an appeal for urgent military aid from France by Mali’s government a few days ago, France promptly intervened to support the efforts of Mali’s armed forces to push back the Islamist advance. According to a Reuters report, “France’s intervention immediately tipped the military balance of power,” enabling Malian government forces to retake the town recently seized by the Islamists. 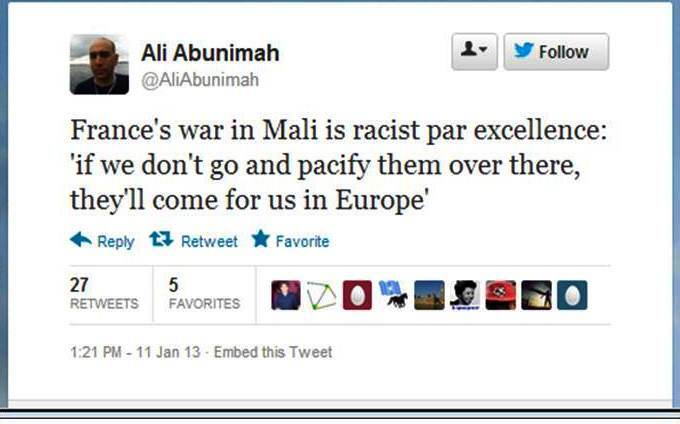 Apparently, for a progressive “pro-Palestinian” activist like Ali Abunimah, there is nothing wrong with the reign of terror and destruction imposed by Islamists in Mali – but when a western country helps the armed forces of Mali to drive the Islamist terror groups back, it’s time to express outrage. Since Abunimah is a regular Al Jazeera contributor – both for the website and as a studio guest – one could wonder if this is the kind of “nuance” that the New York Times editorial board had in mind when it warmly welcomed the news about the planned launch of Al Jazeera America. This was also cross-posted at Harry’s Place. 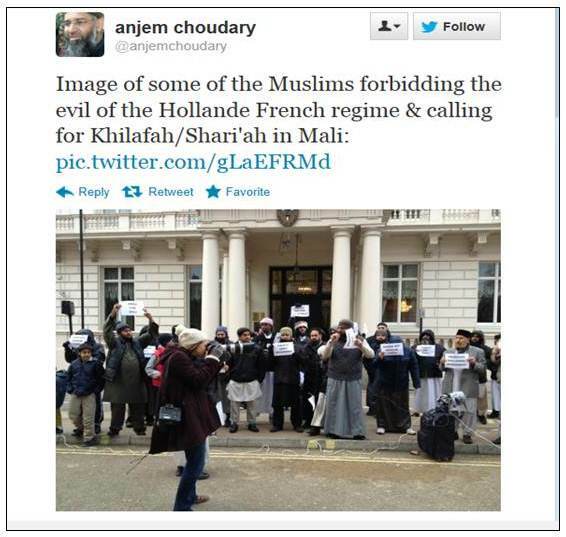 And according to a report in the Egypt Independent, Jama’a al-Islamiya has also called for protests at the French embassy against the intervention in Mali. 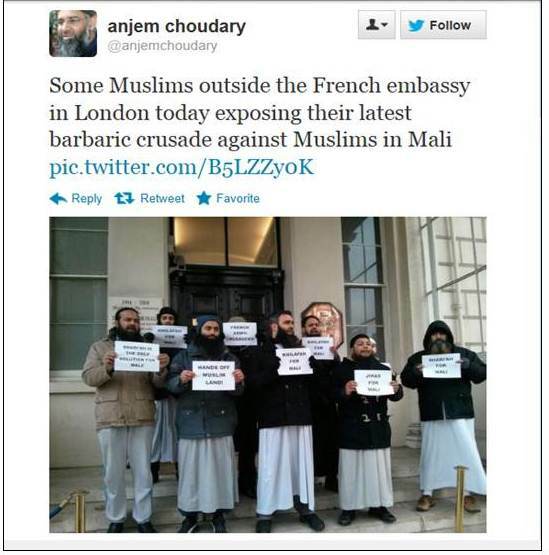 The “truly reprehensible protesters at the French embassy in London” mentioned here are obviously the ones pictured above. In a post entitled “Confessions of a lapsed leftist,” I tried to explain more than a year ago why my lifelong allegiance to the left had begun to crumble. Of course, many Israelis who had supported “Peace Now” in the 1990s and who had hoped that the negotiations at Camp David and Taba would result in a peace agreement went through a similar experience in view of the fact that the Palestinians chose to respond to Israel’s offers with the long and bloody “Al Aqsa”-Intifada. The historian Benny Morris has repeatedly described the unfortunate learning process that many of us went through, most recently last fall in a long interview with Ha’aretz. The problem is that Israel’s left – which represented the peace camp – has not been able or willing to go through the same learning process. As a result, there are lots of politically homeless people like me in Israel, and I think the dizzying proliferation of new parties over the past few years is at least in part a reflection of this widespread homelessness. Just in time for International Women’s Day on March 8, the UN Commission on the Status of Women (CSW) has apparently decided that one of its most urgent concerns should be blaming Israel’s occupation of the West Bank for “degrading” the living conditions of Palestinian women. That’s perhaps a good occasion to highlight what the CSW prefers to overlook – so here are just a few of the “degradations” women elsewhere in the Muslim and Arab world have to endure. At this link you can watch a clip from 2009 showing Taliban beating a young girl; and here’s a clip that documents the fate of a woman in Sudan who was accused of having violated Islamic standards of decency by wearing trousers under her full-length overcoat. Where would you have to go to read that the Russian and Chinese veto of a UN Security Council resolution demanding an end to the bloody violence in Syria was “the same” as a US veto of a condemnation of Israeli settlement construction cast in February 2011 ? Welcome to the world of +972, a left-wing Israel-Palestine blog that “wants to sound the alarm on a Jewish state it believes is destroying itself.” Israelis don’t take much notice of the English-language publication, but outside of Israel, there is of course a large market for everything that is “critical” of the Jewish state. To amplify this criticism a bit, the German Heinrich Böll Stiftung supports +972 in the context of the foundation’s “differentiated and pluralistic agenda” in Israel, and since one of +972 co-founders has been awarded a scholarship by the British Council, he is currently busy “criticizing” Israel in London. Of course, “criticizing” Israel also often means “criticizing” US support for Israel, and that’s what Noam Sheizaf is presumably hoping to do when he equates the Russian and Chinese veto – widely expected to embolden Assad to intensify his brutal crackdown on the Syrian opposition – with the US veto that prevented the umpteenth condemnation of Israeli settlement construction. No doubt the principled stand of Assad’s Syria and Gaddafi’s Libya was appreciated back then by many of Israel’s “critics”. Sheizaf of course knows full well that the settlement construction that the international community enthusiastically wanted to condemn yet another time has long been restricted to the major settlement blocs which every peace proposal has envisaged as part of Israel, in exchange for land swaps. It is also well-known that the built-up areas of the settlements “gobble up” less than 2 percent of the pre-1967 West Bank territories, including East Jerusalem. While I don’t have any illusions about a post-Assad regime being in any way less hostile towards Israel, I still wish the Syrians that the UN and all the activists that are so eager to fight for human rights when Israel is accused of violating them — even if it is just by building — would be as energetic and engaged when it comes to murderous atrocities that can’t be blamed on the Jewish state. I don’t-because I don’t think that you oppose the resolution. I simply point out the undeniable fact that your post suggests an entirely inappropriate equivalency between the US veto against the umpteenth attempt to condemn Israeli construction in settlement blocks and the Russian/Chinese veto that is widely seen as a “license to kill” for Assad. One additional point re. my supposed “right-wing” inclinations: So far, I haven’t even once (in my 30+ year life as a voter) voted for a party to the right of Labor. I’m not sure what I will vote in the next election, but writings like you publish here simply tell me that this is not the left I used to support. A left that ignores all relevant context in order to argue that the US is really not much better as Russia and China is not a left I want to be part of. We come together today after a year of turmoil in the Middle East. Great challenges stand on the horizon. People are demanding dignity and seeking liberty after generations of oppression. Extremism threatens fragile societies. Human rights continue to be trampled. Unrest has shaken the foundation of the political order from the straits of Gibraltar to the Persian Gulf to the Caspian Sea. And what issue has this Council deemed the most pressing in its monthly debate on the Middle East? Surprise, surprise…the status of municipal building applications in the West Bank. In the last two monthly briefings by the Secretariat, barely a square inch of Jerusalem or the West Bank was left unexamined. Yet, entire Middle Eastern countries where people are being killed, repressed and tortured daily continue to go without mention. How many times have members of this Council – and many others – repeated this statement: the Israeli-Palestinian Conflict is the central conflict in the Middle East. If you solve that conflict, you solve all the other conflicts in the region. Today one would ridicule that statement. It is obvious that Yemen, Syria, Egypt, Bahrain, and many other conflicts in the Middle East have nothing to do with Israel. The constant repetition of the statement does not make it true. And how many times have members of this Council – and many others – repeated: settlements are the primary obstacle to peace. The repetition of the statement also does not make it true. You won’t hear them say “two states for two peoples” because today the Palestinian leadership is calling for an independent Palestinian state, but insists that its people return to the Jewish state. This would mean the destruction of Israel. The idea that Israel will be flooded with millions of Palestinians will never be accepted. The international community knows it. The Palestinian leadership knows it. But the Palestinian people aren’t hearing it. In a poll conducted by the Palestinian Center for Public Opinion last November, 90%, and I repeat, 90% of Palestinians said that they would not give up the so-called “claim of return.” This gap between their perception and reality is – and will remain – the major obstacle to peace. Since the Palestinian leadership refuses to tell the Palestinian people the truth, the international community has the responsibility to tell them the truth. You have a responsibility to stand up and say that the so-called “claim of return” is a non-starter. Yet, many around this table who never miss an opportunity to tell Israel what it has to do for peace –conveniently lose their voices when it comes time to tell the Palestinian people about the basic compromises they will have to make for peace. Israel’s UN Ambassador Ron Prosor at the UN Security Council on the situation in the Middle East, January 24, 2012. There is a straight line from the UN’s obsessive focus on condemning Israel to the cynical decision of the Arab League to appoint “the world’s worst human rights observer” as the head of its mission to monitor violence in Syria. This dismal record is hardly surprising in view of the fact that even the worst human rights violators are eligible to serve on the UNHRC – while the world’s only Jewish state is excluded, since the Arab and Muslim states will not admit Israel as member of the Asian regional group: I’ve called it Apartheid, UN-style. Yet another illustration of the limitless hypocrisy that is so commonplace at the UN was the recent nomination of Syria to two committees dealing with human rights, and the approval of this nomination by the UNESCO Executive Board. Dabi may be the unlikeliest leader of a humanitarian mission the world has ever seen. He is a staunch loyalist of Sudan’s President Omar al-Bashir, who is wanted by the International Criminal Court for genocide and crimes against humanity for his government’s policies in Darfur. And Dabi’s own record in the restive Sudanese region, where he stands accused of presiding over the creation of the feared Arab militias known as the “janjaweed,” is enough to make any human rights activist blanch. If past experience is any guide, it is unfortunately not really true that human rights activists always “blanch” (or blush) when human rights abusers play human rights defenders — and given the composition of the UNHRC and some other UN human rights groups, Dabi is actually not such an unlikely leader for a “humanitarian” mission. There were always victims of human rights abuses who had to pay a painful price for the mockery that was made of human rights – this time, it may be the turn of the Syrians. The Warped Mirror is licensed under a Creative Commons Attribution-NonCommercial-NoDerivs 3.0 Unported License.